Subscribe for our Sup Yoga Kite week in Langebaan (SA)! 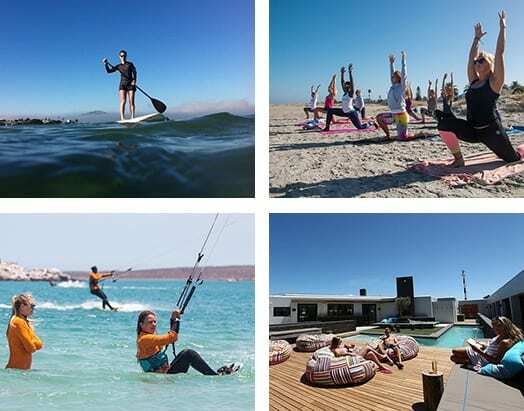 Together with MM SUP we offer a Sup Yoga Kite week in Langebaan (South Africa). The location is perfect for morning paddles as the lagune is calm then and the wind only starts blowing around lunchtime. While paddling you might even meet some seals. Afternoons are perfect for kiteboarding or other activities we offer such as a mountainbike tour and a game drive to spot some wildlife. During this you stay in one of the (shared) rooms at Windtown Lagoon Hotel in Langebaan at about an hour drive from Cape Town. 7 FRIDAY – 6.45 BREAKFAST PACKAGE – 7.00 MOUNTAINBIKE TOUR WC NATIONAL PARK – EARLY LUNCH GEELBEK – 15.30 YOGA AT THE ROOFTOP WINDTOWN – 18.00 BBQ DINNER WINDTOWN. 8 SATURDAY – CHILL SLEEP ON LATEPOSSIBLE TO RENT A PADDLE BOARD, BOOK A KITEBOARD CLASS OR JUST CHILL BEFORE TAKE OFF. *The program might change due to weather changes. Price €1275,- including 7 nights accommodation, all activities, drinks and snacks during activities, 7x breakfast and 5 x dinner at Windtown, excluding alcoholic beverages and extra drinks ordered at Windtown. We also supply a car which brings you to all activities offered. The rooms are shared with two or three. If you want a room for yourself we charge an extra €325 for the week. Airport transfers can be arranged by Windtown and cost €220. You can share the transfer car with three persons to split costs. Or you could rent a car for the week if you also want to explore the area in the free time. Also follow our Facebook event page.